The older one gets, the more one is bombarded with messages about the need to create an estate plan. While not the lightest topic, it is often directly tied to a family’s long-term financial and emotional health. Failure to create an estate plan can lead to the distribution of assets to unintended and/or undesired individuals, as well as bitter family feuds that can destroy relationships. Once these critical documents are executed, though, the creator’s responsibility does not disappear, especially if the estate plan was created rather early in life. Laws change, (such as the proposed elimination of the federal death tax), people are born and die, and expectations/needs change as life progresses. For this reason, periodic reviews and/or updates of estate planning documents are necessary to ensure they are still valid and enforceable, and if they still reflect the desires of the creator. A discussion of some life changes that could directly affect the viability of an estate, and how to keep the documents relevant going forward, will follow below. Once people get married and have children, thoughts about the future and not always being there become common. This same sense of having a finite amount of time remaining typically occurs again as a person enters retirement and/or turns 65, the age generally considered to mark the beginning of one’s senior years. As a person shifts to a new stage in life, this is a good time to consider reviewing existing estate planning documents to see if they still meet a person’s needs and goals. Many of a person’s most valuable assets pass outside of a will or trust, and instead are received by a beneficiary designated in a contract. Common examples include: life insurance, tax-deferred retirement accounts, investment accounts and standard banking accounts. The value of these assets are often at their height in a person’s later years, and the increase in value may be cause to change the beneficiary to avoid unnecessary taxation or to reflect current needs and desires. Further, if a family business is being wound down or sold, adjustments to the estate plan to account for the payout/purchase price, and how this could impact a person’s distribution to a spouse, children and grandchildren needs to be reviewed. In addition, a person’s estate plan may allow for charitable giving, which offers attractive tax advantages not previously possible due to financial constraints or helping children get established. Finally, a person may be permitted to earmark a portion of an asset, such as life insurance benefits, to charity, thereby eliminating a potential concern about completely depriving a spouse or other family member from inheriting the property. the location of the original estate planning documents (copies will not suffice for most purposes). 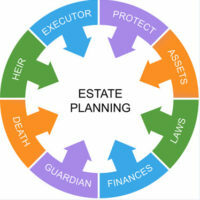 Estate planning is too important to leave until the last minute, or take a “set it and forget it” attitude. The absence of an estate plan, or one that is outdated or inadequate, could directly affect your family’s financial security. To avoid this outcome, work with an experienced estate planning attorney that knows how to protect your legacy and your family’s interests. William Rambaum, P.A. has decades of experience helping clients with their estate planning needs, and focuses their practice on issues affecting seniors as a certified elder law firm. Contact the Oldsmar office to schedule an appointment.